With Easter just under one month away, one colorful commodity is getting ready to meet the increased demand for the annual holiday. Rainbow radishes from Grimmway Farms/Cal-Organic Farms in Bakersfield, Ca. 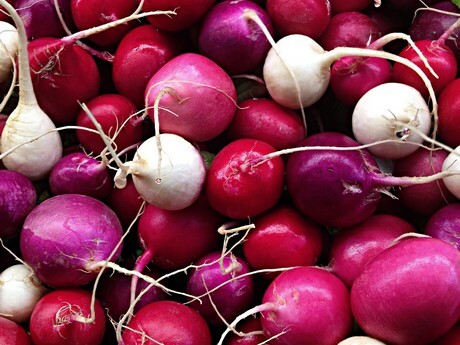 are a medley of red, pink, purple and white radishes. “We have good supply of our organic rainbow radishes and we’re well-poised to meet consumer demand around the holiday,” says Grimmway’s Bob Borda, vice-president of organic sales. This year’s strong yields, Borda adds, match last year’s volume of the radishes. The radishes are currently grown in California’s Kern County with competing product coming from Monterey County. Borda also adds that radishes are showing strong growth in the market as consumers develop more interest in global flavors and ethnic foods. However, weather issues have put the heat on this year’s radish pricing. “Heavy rains and weather constraints have limited supply on the market which has resulted in higher prices than last year,” says Borda.